People are finally recognizing the value of bats. Maligned for millennia out of fear that they are dirty and diseased, even blood-sucking vampires, bats have faced widespread extermination. While some tropical bats do feed on blood, and rabies is a genuine concern, the advantages of having these creatures around far outweigh the small health hazards they pose. As pollinators of flowers and distributors of seeds, they play an important ecological role. As predators of insects, they benefit us by devouring pests. All bats native to Canada are insectivores. They typically consume about half their weight in insects each night, preferring moths, beetles, mayflies, midges, and mosquitoes (the closest thing to vampires among us). Along with our growing respect for bats comes awareness that their populations are plummeting or — in the case of Keen's, fringed, spotted, and pallid bats — at risk of extinction in Canada. Pesticides absorbed from the insects that bats eat are a key threat. Colonial species, such as yuma, little brown, and pipistrelle bats, face a chronic lack of summer roosts (tree cavities, abandoned buildings, and crevices in rocks). These short- distance migrants find a similar shortage during their search for winter roosts (cellars, tunnels, caves, and old mine shafts) in which to hibernate. Solitary species, such as hoary, red, and silver-haired bats, are long-distance migrants with different roosting needs (leafy hardwood trees in summer, hollow trees down south in winter). Our efforts to conserve and create bat habitat will allow these mammalian marvels to continue as some of nature's most valuable creatures. Move over, birds and butterflies. Bats appreciate gardens too — not so much for their blooms as for the delectable bugs they attract. To turn your schoolyard into a bat magnet, start by enticing night-flying insects with plants that bloom both day and night. Choose bittercress, four-o'clock, fireweed, goldenrod, phlox, wild sweet-William, bachelor's-buttons, and cardinal flower, as well as aromatic herbs like lavender, spearmint, thyme, and sage. Arrange plantings in clumps to concentrate food sources. For biointensive gardening tips, see "A Square Yard in Your Schoolyard". Install a bat light in your schoolyard. Leave it on at dusk to encourage moths and other night-flying insects and, consequently, foraging bats. Mercury vapour lights are particularly alluring to insects. Build a shallow pond that appeals to mayflies, caddis-flies, and other insects that start life in freshwater and emerge as adults. Guidelines appear here: “Build a Dragonfly Pond”. Avoid using pesticides. They will not only negate your efforts to attract bugs and bats but also harm the very species you want to help. Whether they’re coming, going, or just hanging out, most bats can’t do without trees. Plant leafy deciduous and thick coniferous trees, such as elms, maples, spruces, and pines, for hoary, red, and other foliage-roosting bats. Conserve living and dead hollow trees for evening, pallid, big brown, and other cavity-roosting bats. 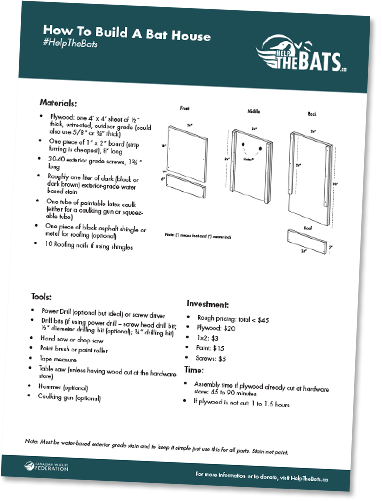 Build Your Own Bat House! Learn more about bats. Do a classroom project on these fascinating mammals. You'll find an abundance of information on Canada's 19 species of bats in your library and on the internet. Whether they're coming, going, or just hanging out, most bats can't do without trees. Plant leafy deciduous and thick coniferous trees, such as elms, maples, spruces, and pines, for hoary, red, and other foliage-roosting bats. Conserve living and dead hollow trees for evening, pallid, big brown, and other cavity- roosting bats. Create positive public relations for bats by exploding old myths and misunderstandings and informing your family and friends about their ecological importance and the threats they're up against. Urge others to stay out of caves and old mine shafts without permission from conservation authorities. Such disruptions can seriously harm, or even kill, nursing and hibernating bats and bring people too close to potentially rabid animals. Contact Bat Conservation International (BCI) for additional projects, such as guidelines for turning bridges and culverts into ideal bat abodes. E-mail batinfo@batcon.org, or visit www.batcon.org. Much to the surprise of wildlife biologists, sheet metal collars wrapped around trees not only protect nesting birds from predators but also create ideal roosts for bats. 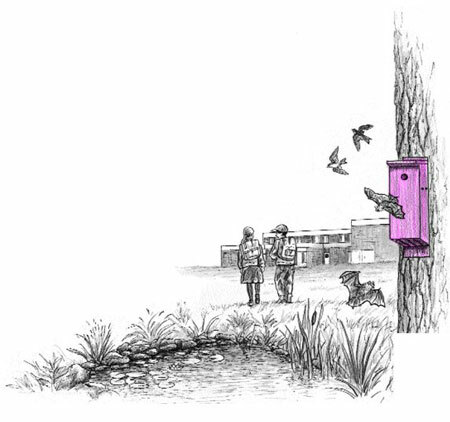 Corrugated metal, loosely fitted, allows bats that normally roost under bark to regulate their temperatures by crawling around a tree to the sunny or shady side. Unlike loose bark, these metal collars can be placed where needed and last for years. They should be at least a metre wide, secured along the seam with aluminum nails, and have enough space underneath (two or three centimetres wide) that bats can enter and move around.